At LeBrun Toyota we have just the deal for you. Within our inventory of Certified Pre-Owned Cars for Sale, you will find “like new” vehicles with low miles at a low price with the added bonuses you won’t find with our other used cars. Receive benefits such as a FREE oil change and complimentary roadside assistance when choosing a certified vehicle. Check out these Toyota Certified vehicles and get your test drive scheduled before your ideal vehicle is gone! Contact our team with any questions you may have. KBB.com Best Resale Value Awards. Boasts 25 Highway MPG and 18 City MPG! This Toyota Sienna boasts a Regular Unleaded V-6 3.5 L/211 engine powering this Automatic transmission. Window Grid And Roof Mount Diversity Antenna, Variable Intermittent Wipers w/Heated Wiper Park, Valet Function. * This Toyota Sienna Features the Following Options *Trunk/Hatch Auto-Latch, Trip Computer, Transmission: Electronic 6-Speed Automatic w/OD, Transmission w/Sequential Shift Control, Torsion Beam Rear Suspension w/Coil Springs, Tailgate/Rear Door Lock Included w/Power Door Locks, Strut Front Suspension w/Coil Springs, Steel Spare Wheel, Single Stainless Steel Exhaust, Side Impact Beams. * The Votes are Counted *KBB.com 16 Best Family Cars, KBB.com Best Buy Awards Finalist, KBB.com Best Resale Value Awards. * Stop By Today *For a must-own Toyota Sienna come see us at LeBrun Toyota, 2435 Route 332, Canandaigua, NY 14424. Just minutes away!Get Toyota reliability at a great price. 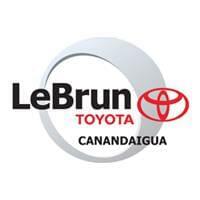 Contact Nicholas Easton with a call/text/facetime at 585-301-0677 or at nicholas@lebruntoyota.com to schedule your test drive today! Interested in more pictures? Want a video of the vehicle? Any further questions? JUST ASK! Your first oil change is free within the next year/15,000 miles. 1 Year/15,000 miles of complimentary roadside assistance for all used vehicles sold from LeBrun Toyota. As always every vehicle we sell retail comes with a 6 month/6,000 mile limited warranty.